Emma Palmer-Cooper on the value of working with members of the public as more than just the subjects of research. Sometimes what I do can feel like an uphill battle… there’s a common belief that ‘public patient involvement’ (also dubbed ‘PPI’, complete with an eye-roll) is a box-ticking exercise, or has no scientific worth. Basic lay review of an already formed grant or ethics application has become the norm for many teams. This is not good involvement, and is not good science. One of the main issues I face in my roles is that a lot of people don’t know involving the public at any stage of the research process (other than as participants) is ‘a thing’. In essence, involvement is carrying out research with members of public, or co-designing protocols, rather than considering people as ‘research subjects’. The healthcare community is very good at involving patients in service design, but when planning research to help the same group of people, we can be shockingly ill-informed. I have come to realise that much of this lack of awareness is down to attitudes of departments and researchers. That’s why I want to foster discussions and change attitudes. And I begin with myself: I don’t have a glowing history of public involvement in my own research practices! When I came to fill in my IRAS ethics form for a PhD study, I was told to say ‘participants aren’t involved due to funding/time/etc…’. I did, and I got ethical approval. Life went on. However, my PhD project could have been very different had I actually looked into public involvement. I could have saved myself a lot of time, and gathered a lot more data. My project used computerised tests and included healthy adults and those experiencing mental illness, all aged between 18 and 90 years. Having run a pilot study to test the basic methodology with younger adults, I was concerned that the tests would be overwhelming to older participants. On advice from an older relative, I conducted another pilot study with older members of the population, asking about ways the tests could be more accessible. In response to their feedback, I made amendments to the protocol, and my recruitment rates of older healthy adults and patients with memory difficulties were on target. Little did I know this was all public involvement, and quite a good example at that! My lack of public involvement knowledge was my downfall when I came to run the phase of research relating to patients with psychosis. I had ‘prior knowledge’ from other projects that patients with psychotic illness often required breaks in lengthy research protocols, and had factored this in. However, I had not considered that the tasks would not be suitable for patients with a short attention span. Despite recruiting to target, less than half of patients were able to complete the computerised tasks in full, meaning the data did not have significant power, and I could not publish my findings in a peer-reviewed journal. In hindsight, doing appropriate involvement activities with this patient group, rather than relying on prior knowledge, could have led to simple protocol amendments and more data. I still had data and I wrote my thesis. However, I want to look into my PhD topic in more depth, so I now have to go right back to the planning stage and talk to patients before I design any future studies. There are many reasons why researchers should talk to the public before starting up a research project. The message that rings clearest in our professional community is that many funders now place value on public involvement from the grant-writing stage, so you need to do it to get funding. However, this can bring us back to box-ticking exercises that have no meaningful impact on research design. More notably, the public know that is what we are doing and start to resent giving their time. I know because I have spoken to them. The ‘moral’ reasoning for public involvement is that patients, carers and other affected publics have a right to give input into study design. In addition, projects funded by research councils and other public funders are made possible by members of the public. Common reasons cited by colleagues for not involving the public are ‘no time’ or ‘not applicable’. In terms of time, my recommendation is simple: plan it in. Researchers have to stick to strict project timelines for a whole host of reasons, and we are no strangers to a Gantt chart, so a few extra meetings for the duration of a project is not a disaster. I am aware this is an over-simplification – teams need to plan the meetings as well as attend them, and these meetings will likely have to be outside of ‘normal working hours’ (to ensure a diverse cross-section of the population is able to be involved). These might seem like ‘annoying extras’, but it is good science. To some, the value of involvement in research is not immediately clear: it’s considered ‘not applicable’. I agree that the usefulness of involvement in biomedical research with non-human or cellular specimens is not always clear; but as most psychological studies have human participants, there is a place for public and patient viewpoints in the design and running of this work. An equally cited reason not to involve the public is a lack of funding. I have been in this situation, and it is not so easy to address. There are cheaper ways to involve the public when the project is yet to be funded, such as using www.peopleinresearch.org to advertise opportunities. Some people want to contribute for free, so let them! You can also host remote opportunities online, where contributors are able to comment in their own time, rather than in face-to-face meetings. Once a grant application is in the works, the project timeline can factor involvement as initial research activities, before protocols are finalised and before the submission of ethical approvals. Why should we know best? As researchers, we know about different possible research methods, ethical issues, and appropriate statistics. We know how questions can be answered. Members of the public can let us know what questions are important. 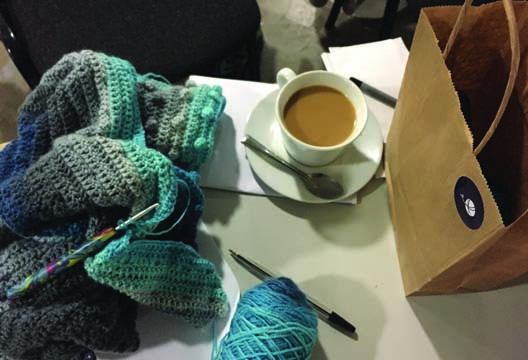 At the recent ‘Knit a Neuron’ event hosted by Oxford University’s Curiosity Carnival, guests asked researchers a number of times about the link between knitting and wellbeing. We did some digging and it turns out the evidence is thin. So now, we are going to look into it. We know how the research could be done, and are starting a project to consult with the public on what to ask, and how to go about it (www.yarnfulnessproject.org). - Emma Palmer-Cooper is a Lecturer in Psychology at the University of Southampton, and was previously Patient and Public Involvement Officer for a National Institute for Health Research School, spending most of her time supporting public and stakeholder involvement in research and promoting it to researchers.